We heard good news from an angel today on our Journey to the Manger! All was quiet across the countryside. Lights flickering from the fire had long since dimmed, and the shepherds watched over their flocks resting after a long day. It was a night just like every other night. And then, an angel of the Lord appeared. The darkness disappeared as the glory of the Lord shone around the shepherds and their sheep. They were stunned, shaken from sleep, and terrified. God had chosen one angel to step forward in the fields to rouse the shepherds and make the most amazing baby announcement in all history. Fear not, for behold I bring you good news of great joy that will be for all people. For unto you is born this day in the City of David a Savior, who is Christ the Lord. 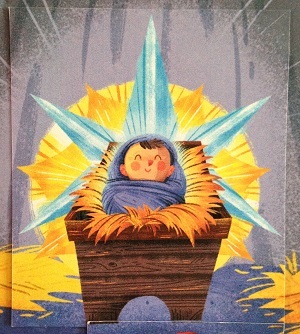 And this will be a sign for you: you will find a baby wrapped in swaddling cloths and lying in a manger. Today we dressed up as angels to proclaim good news of great joy! We donned tinsel halos, white T-shirts and yellow tie belts for costumes, and gave each other “thumbs up” to share our good news. God is looking for people willing to introduce others to the Savior of the world, to announce that Jesus is here and waiting to meet them. Who can we share this Good News with this Christmas? Angel Lauren gives two thumbs-up to share her good news!